You use less paper, reducing your environmental footprint. 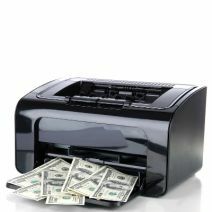 You spend less capital on paper, ink, and toner. You reduce the amount of clutter in your office. There are two technologies that have made storing files vastly easier, without increasing the cost of printing. Combined, your files can be stored digitally in an organized manner, allowing you to keep your office clean and tidy. One of the best technologies that keep your office clutter-free is the PDF. Called the Portable Document Format, the PDF does exactly that; it’s a file format that lets users view documents in an electronic environment. The great thing about a PDF file is that it lets you view documents without the need for certain application software or hardware, letting you view the document as-is. Since a PDF is a digital document, they can be stored and filed away on a computer or network, but read on virtually any type of device. This eliminates the need to print physical documents out, reducing the amount of resources you expend on them. There are several occasions when a business might need to print out a document that must be signed, like a contract or maybe even a receipt. In this case, it often can’t be avoided that a physical document is needed; you can’t “sign” a digital document, right? Wrong. Instead of asking the document’s recipient to print out the document, sign it, and fax it back to you, digital signatures can be completed in the click of a button. With digital signing solutions, users can send and receive signed documents, all without unnecessarily printing them out. As you can imagine, this saves even more space in your business’s filing system, and helps you get more prompt responses from the signee. An electronic record filing system is the cornerstone of keeping your business free of physical filing storage. In the past, you might have had to deal with filing cabinets filled with all kinds of documents, like employee files, vendor and customer agreements, etc. These filing cabinets can quickly grow too large to maintain and are difficult to organize. If your records are stored electronically, you don’t have to worry about running out of space, and your files are stored in an easy-to-access library or interface. Plus, they can be backed up. Tektonic can help your business dodge unnecessary printing costs by equipping your organization with a quality document management solution. To learn more, give us a call at (416) 256-9928.